The Percheron is among the gentle giants of the horse world. Once a war horse, then a popular and powerful draft horse, the Percheron today is equally comfortable under saddle and in harness. It is competitive on the horse-pull circuit, in which teams of horses are matched against ever-increasing weights. They are often crossed with light horse breeds such as Thoroughbreds to produce a sport-type riding horse. The Percheron breed was developed in the Perche province of France's Normandy region. The earliest Percherons might have been crosses between the Barbs brought by the Moors and the large Flemish draft (the "great horse") breeds. Several other theories about their origins exist as well. Arabian bloodlines eventually were introduced to add hardiness and refinement. During the 1800s, the French government developed the breed further to use as cavalry horses. The national breeding farm, called the Le Pin National Stud, still breeds Percherons to this day, along with several other breeds of French origin. Early in the 20th century, the Percheron was the most popular draft horse breed in America and the largest draft horse breed registry. Like many draft breeds, their numbers dwindled as the farm tractor and car became the new horsepower, and draft horses were no longer required for farm work. For a time in the U.S., they were on the watch list of the American Livestock Breeds Conservancy but are now growing in numbers and have been taken off the list; however, the Conservancy advises that the breed's numbers still bear monitoring. The Percheron Horse Association of America now includes more than 3,000 members in all 50 U.S. states. The Percheron has heavily muscled shoulders, forearms, and haunches, and gives an overall impression of compact strength. Their necks are sturdy and elegantly arched, with heads vaguely reminiscent of the Arabian influence in their past. They have small, upright ears and flat foreheads, unlike the Arabian's dished face. Percheron horses stand 16.2 to 17.3 HH and weigh from 1,800 to 2,600 pounds, depending on the bloodlines. In France, they can range from 15.1 to 18.1 HH. Percheron breed standards, including body type, color, and size, differ from country to country. The registry minimums in the U.S. and Britain require that horses be in the heavier range. Originally bred as war horses, Percherons today are most often seen driven in harness. Because they are compact, they're ideal for use in logging. Riders who prefer large horses often choose Percherons for their willingness and versatility. Percherons can be ridden Western and English, and they have a captivating presence in the dressage ring. For the timid rider, a steady Percheron horse can be a confidence-building ride. Percherons can be black, gray, chestnut, bay, roan, and sorrel. French-bred Percherons are born black and then turn gray as they mature; no other color is allowed in the registry. Although white markings are permitted, excess white is frowned upon. Unlike the Clydesdale with its heavy leg feathering, the Percheron's legs are clean, with no long hair. 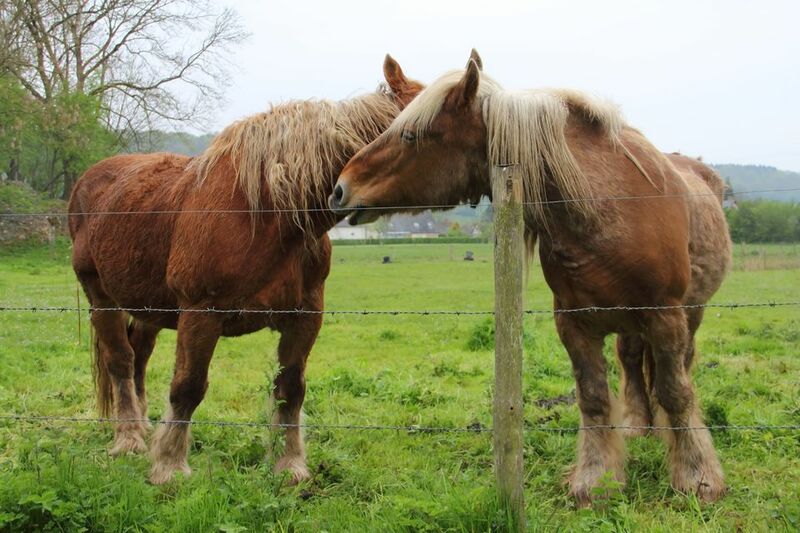 Their manes and tails can be thick and are often wavy. They are a bit more lively than some of their draft horse relatives, and they are often out-crossed with Thoroughbreds, warmbloods, and Baroque breeds such as Andalusians and Lusitanos to be used as sport horses in dressage, eventing, hunting, and pleasure riding. Percherons are prized not only for their muscled stature, alert stance, and proud posture but also for their dispositions. They're intelligent, with a calm demeanor and a willingness to please. Their stamina is legendary; breed enthusiasts in the 1800s touted their ability to travel nearly 40 miles a day at a trot. Members of the French registry bear a distinctive brand on their necks: the intertwined initials of the Société Hippique Percheronne (France's Percheron Horse Society). Jean le Blanc, foaled in the 1800s, is considered one of the founding sires of the modern Percheron breed. Gallipoly was Jean Le Blanc's Arabian sire. In the late 1800s and early 1900s, the Armour Packing Company was well known for the yellow wagons they used to deliver their goods; they were drawn by gray Percherons. Armour's horses competed in the ring against the top horses of the time as well, taking honors in four- and six-horse hitches. The Sells-Floto circus show featured the Armour team as a headline attraction. In the 1980s, the Heinz Percheron hitch was created to honor the tradition of horsedrawn delivery. With its eight black Percherons, the hitch was a popular draw in parades and exhibitions around the U.S. After being retired in 2007, it was donated to the Army, which uses it in ceremonies at Arlington National Cemetery. No history of the Percheron in relatively modern times would be complete without a mention of the Pabst Brewery's draft horses. In the 1800s, the company used the horses to power its mills and deliver beer in Chicago. The family owned a Percheron stud farm, breeding its own stock—which eventually won honors at the 1904 World's Fair and in many other competitive events. The Le Pin National Stud Farm is France's oldest, most prestigious national stud. Known as the "equestrian Versailles," its 17th-century château, courtyard, and stables house Percherons and at least nine other horse breeds for reproduction. A large Percheron breed show draws admiring crowds, as do the long drives through lush grounds. Interactive displays, films, and other features educate visitors on the storied history of French horses. Is the Percheron Horse Right for You? Because of their docile natures, Percherons can be good horses for beginner riders, many of whom might need mounting blocks to climb aboard. Sweet, tolerant, and easygoing, these majestic horses are ideal for those who lack the experience in horse ownership that other breeds require. They're known as easy keepers who are able to adapt to and thrive in many different climates and conditions.